When you don't have anyone to play with in the flesh, nothing beats a round of competitive online Scrabble. If you're constantly on the move, the Scrabble app developed by Electronic Arts (EA) for Android and iOS mobile devices is probably your favorite way to play. But let's face it—if you love Scrabble, you probably love all types of word games, and if you're on the hunt for that next fun and challenging logical mobile game, we've got a great suggestion for you. We present to you Word Ranch, a fun and challenging iOS word puzzle game that we played recently. We decided it is worth writing and sharing for because it is beautifully designed, with great colorful graphics, created for both iPhone and iPad and it’s even offering an iMessenger. Filled with tons of different word puzzles for you to solve, this game is perfect for exercising your brain and having fun at the same time. 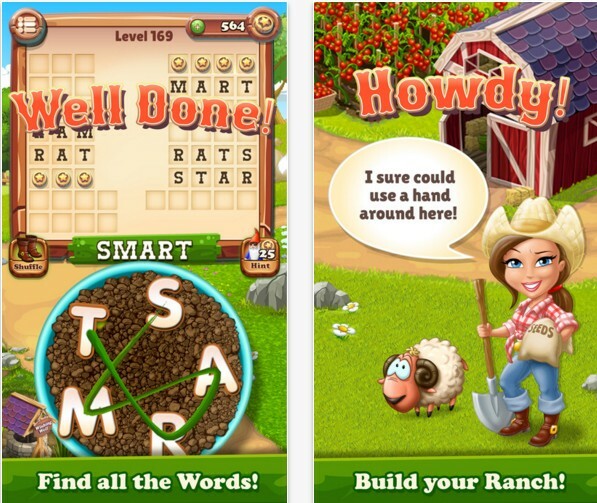 Behind the gameplay of Word Ranch there is a great character named Sarah. She needs help in building the ranch of her dreams. How can you help her? By solving as many word puzzles as you can! Just swipe with your finger on the puzzles, form words and complete as many levels as possible. The game features more than 900 challenging levels, bonus rounds, coins, goodies, a wishing well for extra words, etc. Additionally, you can play it offline, anywhere you are, anytime you want. Build your brain muscle and play this unforgettable word search puzzle game by downloading it for free from the App Store.